How does a classical landscape convey meaning? 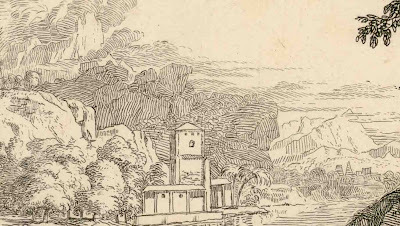 Interest may be leaning away from artworks reflecting the academic tradition, such as Albert Meyering’s etching, Paysage Romain. After all, Meyering’s choice of subject—classically robed figures set in a landscape featuring an antique monument topped with a large urn—along with his perfunctory rendering style and calculated composition is not relevant to a contemporary audience. While not disregarding the important point that this print exhibits aesthetics of the late seventeenth century, the following discussion focuses on key visual devices employed in the print that are still critical for visual communication. Condition: The print is cut on the plate mark. It is in pristine condition and is not pasted down. I am selling this print for $150 AUD including postage and handling to anywhere in the world. Please contact me using the email link at the top of the page if you are interested or click the “Buy Now” button. 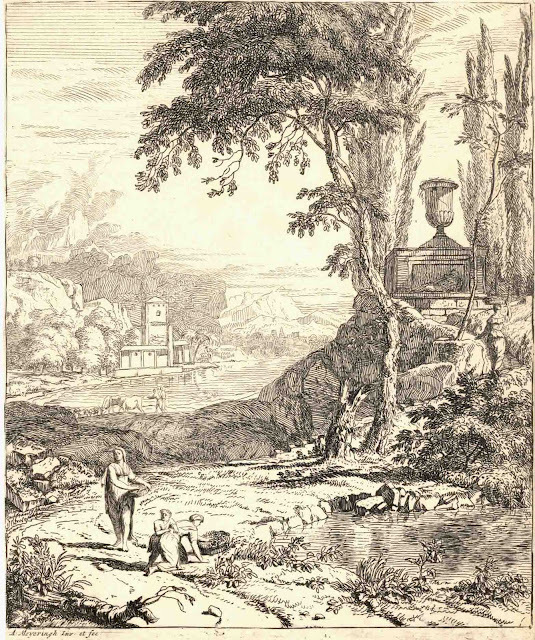 First, let us assume that a critical meaning to be negotiated from this image is the common theme of the seventeenth century: the transiency of life (vanitas) symbolised by contrast between the monument—a tomb perhaps?—capping the hillock on the right and the surrounding figures engaged in everyday activities such as picking and carrying flowers. An essential construct in projecting this meaning are the pictorial rhythms connecting the monument with the figures. For example, the standing figure on the left is linked to the monument by gently arcing lines created by the upper and lower silhouette edges of the rock outcrop in the middle distance (see detail below). Rhythm also connects the two figures in the foreground with the monument. Here, the direction that the larger figure faces aligns with the direction of a bowed tree stump that pictorially points to the monument. Similarly, the curving path along which the figure on the far right walks literally connects this figure to the monument. These rhythms connect the figures to the monument to allow meaning to be negotiated but there are other visual devices at play as well. One of the more subtle of these devices is contrast of different drawing styles. Meyering uses this contrast to differentiate the external appearance of everyday impermanent reality exemplified by the moving figures and sinuous forms of the trees from the timeless rock-solid reality of the monument. The idea of using different drawing styles for portraying different subject attributes is not unusual; in fact it is one of the fundamental principles of graphic illustration. To project the notion of vanitas, however, Meyering uses curved lines depicting the living reality of organic landscape features juxtaposed with straight hatched lines depicting the inorganic reality of the monument and other non-transient features (i.e. rocks, mountains and distant buildings). 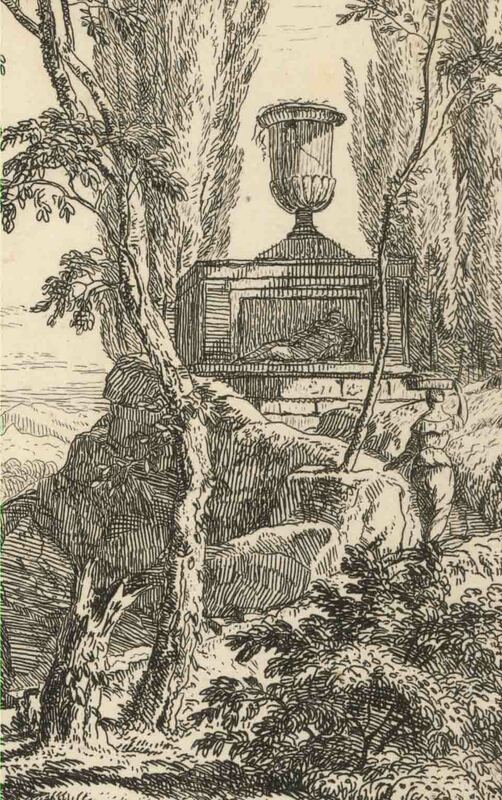 In the detail below, for example, the mechanical rendering of the urn in horizontal and vertical marks is framed by the loosely drawn foliage as if Meyering was rendering a hard nut in a flexible kernel. Communicating the notion of organic life in foliage is not as simple an exercise as drawing what a tree looks like with curving contour marks. There is difficulty in connoting an aura of life even when curved lines are contrasted with mechanically straight lines, as found in the rendering of the monument. The way that Meyering gives the spark of life to his trees is by using different approaches for depicting foliage. 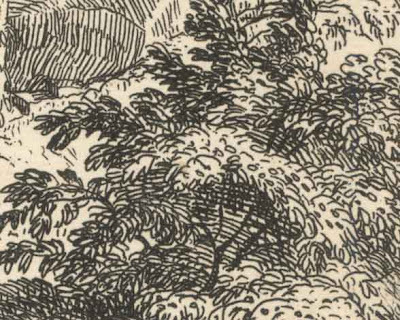 In the detail below, for instance, the foliage mass advancing towards the viewer is depicted in light tones while foliage and branches further back are depicted in dark tones. This arrangement separates the tones of the foliage into distinct spatial zones with the front zone showing daylight on foliage set against a background zone showing the shadowy inner core of trunks and branches. Meyering then connects these spatial zones with a bridge of aligned curved marks that describe in space (i.e. “flesh out”) the tree’s interior realms where birds fly through. These are the marks that give the flux of life to his portrayal of trees. Of course, Meyering was not the first to portray trees in this way. The use of tonal zones and connecting marks pictorially carving out negative spaces is a convention dating back to the fifteenth century. Similarly, the way the Meyering codified concrete reality with mechanically straight looking lines (see detail below) was not a wholly original approach. 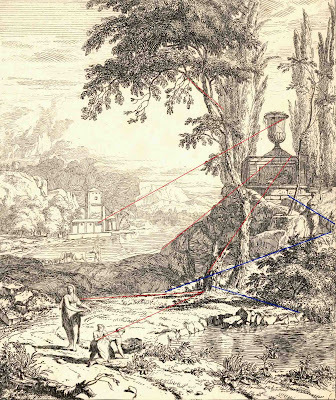 Compare, for example how Claude Lorrain (discussed in my last post) portrayed an earth embankment and how Grimaldi (discussed two posts ago) portrayed a fortress with aligned straight lines.